The phone call came out of the blue. 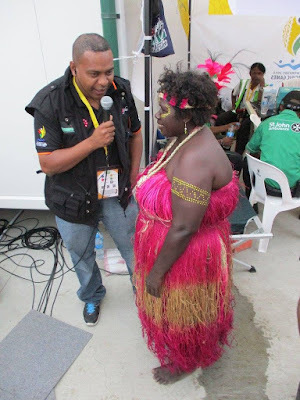 “Well, Port Moresby is hosting the Pacific Games and the NBC want your help preparing the broadcast team.” I immediately agreed to be Advisory Producer for the National Broadcasting Corporation’s Pacific Games coverage. During my first training trip to PNG, I learned much more than I taught. I learned about culture and adult learning and mostly, I learned what I didn’t know. Five years on though, I’d completed a Masters Degree and backed up all my development broadcast ideas with rigorous research. 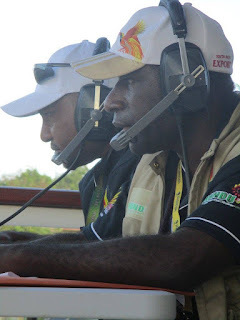 I’d also had the chance to test my teaching system by helping to establish an indigenous broadcast team for the Tiwi Islands Football League. I knew I could help institute a quality sports commentary program but this was a whole other level. It is to the Commonwealth Games as they are to the Olympics. Twenty-four countries contesting 30 sports. 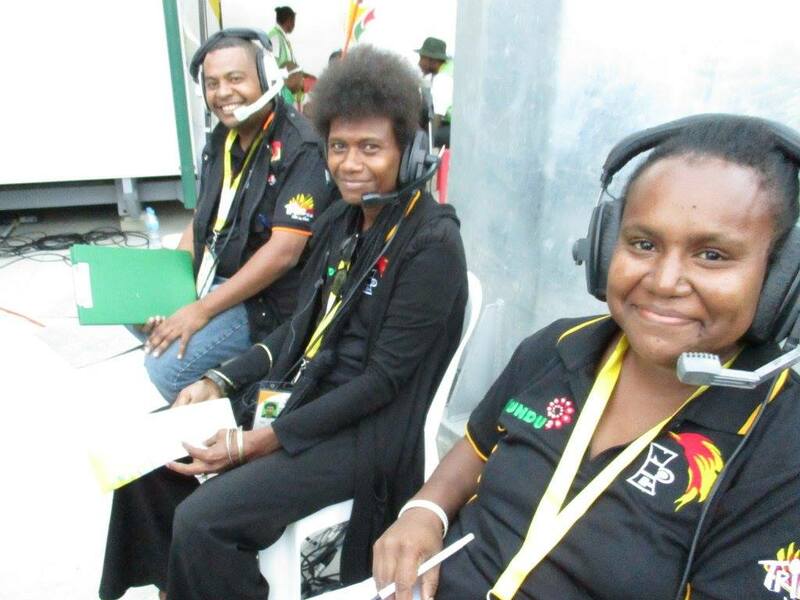 For PNG, the Pacific Games represented the biggest international sports undertaking in the developing nation’s history, relatively far bigger than Sydney hosting the Olympics. One of the key motivations was to help unite a nation that more often identifies along tribal or provincial lines. Accordingly, as the national broadcaster, the Niugini Broadcasting Corporation, took its role very seriously. “We are going to do just like others do for the Olympics, 12 hours a day, live sports coverage,” NBC’s Head of Pacific Game Coverage Stan Ivahupa told me confidently. NBC had sparse resources and a tiny sports broadcast team. This was way beyond existing capacity. So they did something that would never happen in Australia. 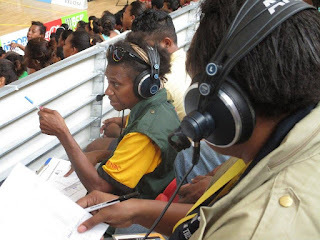 They brought in talented and hard-working broadcasters and journalists from right across Papua New Guinea, from Sepik to Milne Bay via East New Britain and the Highlands. Some, like the late Mark Sapias, were as respected as wise chiefs. He’d forgotten more than I know. Others were barely out of school and hadn’t even heard of certain sports, much less covered them or commentated them. Importantly, there were lots of women. The NBC has brilliant female broadcasters and producers, some excellent sportswomen in their day, but had little sports broadcast experience. Every person picked for the NBC team was trusted with providing radio coverage of the biggest international event in history in a country where TVs are uncommon and radio is still king. We came together a few months out and we dreamed big. We knew we would need to do things that had never been done before, that we’d never done before. We committed to the project, to each other, to the Games and to PNG. And we worked – hard. We learned how to commentate. We studied rules. We learned terminology. We practised interviewing. We commentated dozens of sports events with the sound down, experimenting with different commentary combinations. We watched how others did it. We learned and re-learned our commentary system. We honestly analysed our strengths and weaknesses. It was fun, but also confronting and unrelenting. At the end of the first stint, I sat with the Executive Director of Radio, Allen Arifeae. “I’m scared, I don’t think we will be ready,” I said, sweating. I did a lot of that. He smiled back and said slowly and calmly. The team kept working and kept learning. I remember it now like a Rocky training montage. Training, hard, getting better, steel-jawed and ready for the fight. It wasn’t really like that. It was just a slog as people tried to keep doing their jobs and take on a deeply challenging new one as well. But when the entire team assembled at the Opening Ceremony, they were ready. They were a world-class broadcast team. At the last second, we were told that a deal had been done to get us onto a transmission tower in northern Australia and our coverage would be heard by the entire Pacific. History was made almost every minute. Sports covered for the first time. Commentary teams made up entirely of provincial broadcasters. All-female commentary teams. Rookies called gold medal victories. 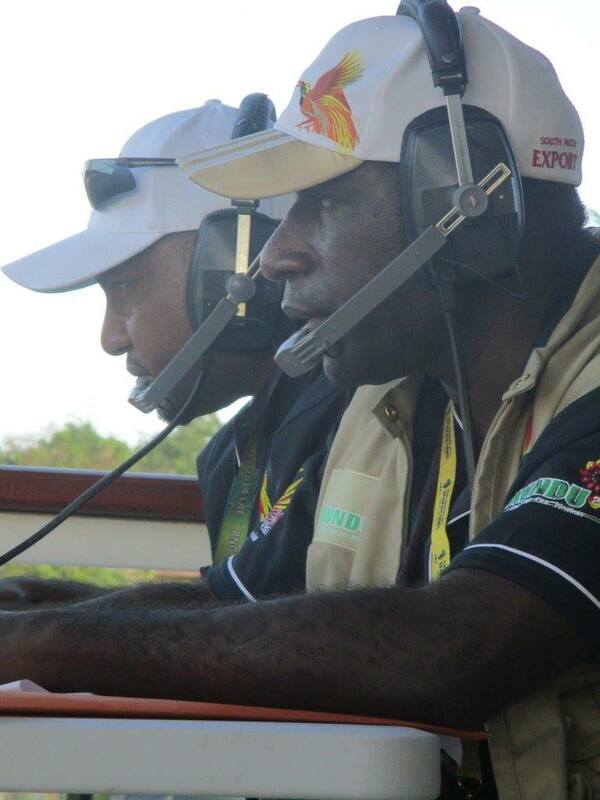 PNG surprised everyone (perhaps even themselves) with a flawless Pacific Games, the best in history. NBC delivered the all-time greatest Games coverage. No other broadcast had prompted more feedback. In true PNG style, it was always eventful. Car accidents, a million technical issues and some tense meetings. At least one guy just walked. But for two weeks all across the Pacific, people were sitting around fires, in school halls and tending gardens hanging on NBC’s words. NBC was proud of itself and PNG was proud of its NBC. 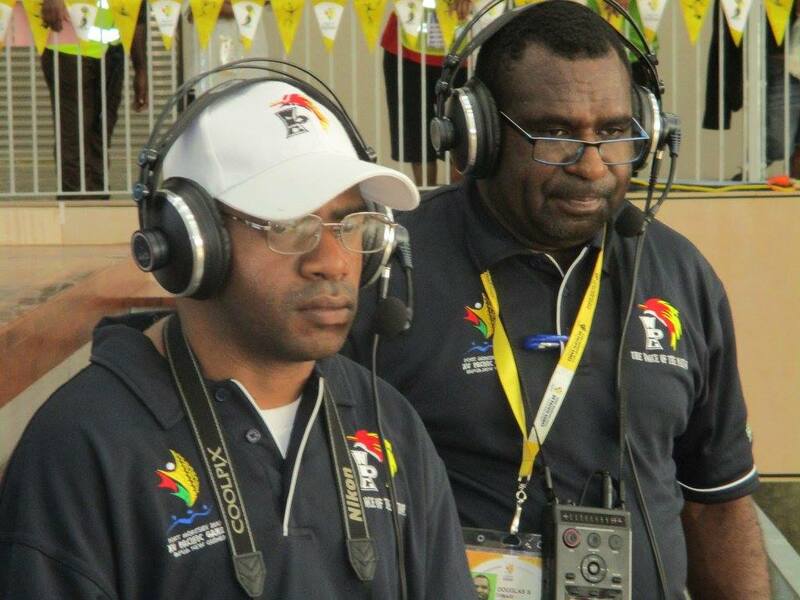 The SP Sports Awards have been honouring the greatest achievements in PNG Sport for 24 years and last night, the NBC Pacific Games Broadcast team won the SP Award for Outstanding Media Coverage of Sport. Our team was crowned the best of the best. Stan and Allen had the honour of collecting the trophy in front of PNG’s finest. I cannot think of any award more richly deserved. It will presumably live in the Port Moresby studios, but a small part of that award belongs in every corner of PNG, with the people who worked so hard for it. Mark Sapias gave everything he had in that broadcast. It physically hurt him to be there and sadly, it would turn out to be his last. It is fitting that Stan dedicated the win to his memory. 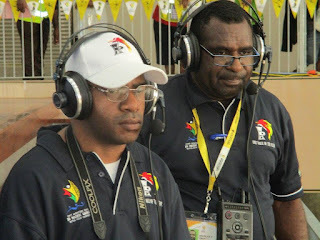 New challenges have since presented themselves for NBC and PNG. I know that for many those exciting days seem a distant memory, but a treasured one. “Happily ever afters” don’t happen in real life. I know, because I was honoured to have witnessed one first hand.